Today’s chatterday backcloth comes via Zooborns. 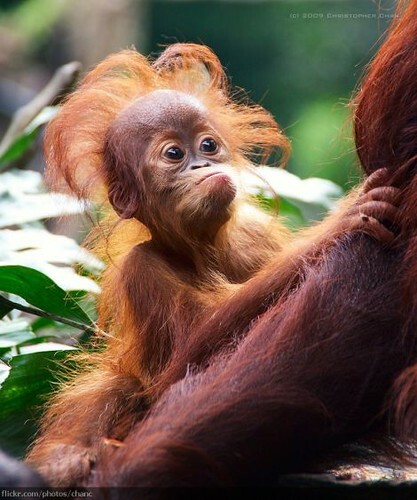 Six month old orang-utan baby Saloma lives at the Singapore Zoo. I’m concerned about the the people in Haiti, and wondering people who were disabled before the quake are managing. That sort of thing never makes it into the news. Ms. M, I am worried too. I did notice that an organization called Portlight is providing support to disabled earthquake survivors; I don’t know a lot about them, but they do have a history of involvement in disaster relief, and when I quickly vetted them, they seemed generally solid. Any other FWD readers who have resources they’d like to add/highlight, please do so in this thread! Gah. I hate it when people don’t realize that being a disability advocate and being pro-choice are NOT mutually exclusive. Not to mention that what I like to call “photo-op activism” doesn’t do a damn thing in helping further the lives of PWDs. In fact, I find it rather offensive and dehumanizing, as if the disabled baby is a toy, a status symbol or some magical object that will suddenly make you incapable of being ableist. Also, I’ve been wondering—am I the only one who is slightly bothered by the phrase “checking one’s privilege?” It never fails to make me envision (and indeed, I plan to illustrate in my sketchbook) a coat check at the Disenfranchisement Hotel, wherein non-disenfranchised allies check their coats of privilege with the bellhop, and then roam about seemingly unencumbered among the disenfranchised. That, to me, simply isn’t accurate. I far prefer the phrase “own your privilege,” since you can’t just take it off like a coat. It’s more like tinted contacts that are permanently fixed to your eyes—they indisputably color your world, no matter how much of an ally you are to whatever movement. By “owning,” instead of “checking,” your privilege, you accept the biases your privilege(s) give you as part of the flaws that make you human, and acknowledge that while you should strive to your very utmost to eliminate bigotry and prejudice from your lives, you can never really take off the contacts, so to speak. Even if the “check” comes from a different metaphor—for all I know it could be a chess reference—I still prefer the idea of “owning your privilege,” since accepting one’s flaws is the first step to true equanimity. Cat — is that the sense that “check” is being used? I’ve always assumed it was “check” in the sense of “confirm the existence of [and fix]”, like you might tell someone that their fly was down. I have had a generally good first week of classes–they seem like they will be good. Also, I saw my counselor on wednesday, and we started planning out how I can move forward toward being evaluated with respect to the possibility I may have Asperger Syndrome. So that’s exciting (also scary). Also, today was really good. I got a Christmas present in the mail, which was lovely, and I also got a very exciting blogging-related offer, which I’ll talk more about once things have been finalized and so forth. You can prepare for the level of physical activity that school brings – walking the dogs (but it was 10 F outside!) not sleeping all day, etc etc. But it was my break, and hello, surgery? But you cannot prepare for the joy that comes from sitting in a tiny hard chair/desk for 3 hours. My pain was better last week, but it’s not now. Hopefully this is just the adjustment period and next week I’ll be nattering on about something else. Same here, Sarah – I imagine “check” to mean “examine”. “Are you diabled? I am. And one thing I have learned over the years is that I care more about the intent of what someone is saying than the actual words they use. When my doctor says that my genetic code is retarded and mutated, I know he isn’t speaking with malice. The same as people reading my article today knew I wasn’t referencing someone with a walking disability. So yeah. I’ve been thinking about this all day, all yesterday. At first, I was inclined to believe she was being snotty. Now I’m not so sure. At any rate, I don’t quite know how to respond, or if I should at all. Savvy Christine – It certainly reads as a tad snarky. It’s fine that she is more interested with the intention behind her words and if that’s the case then she ought to make her writing private and she can use words in any manner that works for her. But when you’re writing for an audience, I don’t personally believe that explanation flies. It is dismissive. I have issues with anxiety and depression and in real life I am liable to toss around “crazy” as in “my crazy is acting up today”. However, there are lots of people who don’t know me or my tendency towards cheek and would find my use of crazy hurtful and offensive. Regardless of what I intended, if the language causes hurt, I’m apt to replace it with something less provocative. Actually, it has been quite exciting for my writing to actively be aware of the kind of language I’m using and seek to replace sketchy wordage with stuff that conveys my meaning, is entertaining and doesn’t hurt a bunch of folks. I’m definitely not perfect in this regard, but when someone says, “Hey, this thing you said kind of hurt me,” my first instinct is not to be defensive. I feel that’s a huge change for me. Savvy Christine, as a person who is myself more concerned with the intentions than with the languge being used, and who tends not to be easily offended by ableist words, I can see that someone would not know that words do actually hurt people with disabilities (many “politically correct”/”people first”/etc. language was introduced by very bigoted TABs who used PC language as a coverup for ableism). Yet if you point out that you, as a PWD (or not even specifying you’re a PWD, since it is really not my business), are offended by the negative use of disability-referencing words, someone should be taken the concern seriously even if they themselves would not be offended. I try to refrain from using ableist language when not self-identifying since having checked the Ableist Word Profile posts here. Things I love: Educating people who actually listen when you are informing them. My bellydance instructor is also an economics professor. She posted on fb and twitter a picture of the wheelchair refuge signs for when there is an emergency in inaccessible areas, absolutely baffled by what it meant. A paragraph later and she responds with that’s fascinating, and they really should tell us professors about these things, they could be important for the safety of all our students. It’s morning, and I probably mangled what I meant. If anyone needs clarification, let me know. I’m recovering from laparoscopic surgery, and I’m having trouble wrapping my head around some people’s reactions to it. The surgery is to diagnose chronic menstrual/pelvic pain, likely endometriosis on top of my adenomyosis. And I am recovering very well, for which I am grateful. In fact, even without pain medication, the pain from my surgery is about 10 times less than the pain that *prompted* the surgery. So I’m having trouble accepting, emotionally, why people are acting like the *surgery* is the big deal. “Here, have some Percocet along with your ibupropfen. You just had surgery.” Well, okay, the Percocet is certainly nice — but ibuprofen and acetaminophen manage the pain just fine. Where was the Percocet for the 14 years of menstrual pain that various NSAIDs, acetaminophen, birth control pills, acupuncture, heat, muscle relaxers, etc., did not touch? WIFC: Exercise! It cures cramps! Me: I cannot stand up or move without blacking out. It’s not that I don’t *want* to exercise, but it is *not possible* for me right now. I think it’s because people have a tendency to map my experiences onto their schema for understanding those experiences. And a lot of their mental processes understand surgery = big deal while menstruation = not a big deal. Which, when it works, it works. But when it doesn’t, it lends itself to people using their not-so-relevant personal experiences to form (and share) opinions about what I should or should not be doing. Even when I ask for friends’ opinions, then, it’s frustrating — because they may not have a good baseline for understanding my situation, but they may also not acknowledge that when giving advice. Tori – ouch, I’m sorry. I tried acupuncture twice, but it cost too much and was really far away. I have been very lucky in the sense that for the most part, I get the Percocet (or Lortab, or…) even when it’s not surgery related pain. Dr. Ego may bother me, but he believes that I have pain, and tries to minimize it, so I can do radical things like walk. I have written two exams in the last 24 hours for courses that I should have finished in January, had I not been in an episode of pretty severe depression. I’m exhausted. I’m afraid of having a single slip up and not being able to graduate university this year (which is already an extra year after my first 4). I am frustrated with invisible disabilities and university accommodations and the humiliation that I feel every time I have to arrange something for myself that is different from the rest of the class. My disabilities office is not helpful. I wanted to go to graduate school next year but I have messed up too many times and no grad school will take me. My boyfriend wants me to jump on a greyhound and come see him 1.5 hours away and all I want to do is nap. There are too many balls in the air and I’m too tired to juggle them, and yet from the outside it looks like nothing at all. I wish I had more friends who could relate. I’m so sorry Ami. School is hard when everything’s in “working order,” when something goes FUBAR, you’re SOL. My disability office is helpful in case anything happens down the line, because look, I visited them, I have the written proof. Most of the stuff last semester got done because I met with professors and e-mailed them on a regular basis. Missed a month due to pain, came back in pain (of course) and struggled with depression/I’m worthless the whole time. About incompletes – one professors said I could do it in January, and later she said I’d have to take the whole class again when it was offered in spring 2011! So glad I finished in time. I wish you the best of luck. About language – I thought about this while I was walking, so I’m going to type it, dangit! I remember from a fun lit class that there are two schools of thought about meaning/intent/etc in books – one is that “word of god” is just that and the other is that it the reader determines what is symbolic/offensive/marxist/etc. Intent does matter – in actions, it’s the difference in the US between the death penalty, life, parole – manslaughter vs murder 1. But when it comes to works of art (movies/plays/books/blogs/paintings/etc), I think the audience rules. The Producers showed that, and if you can’t trust Mel Brooks, who can you trust? Actually, thinking about this some more, I’m reminded of a movie I watched in Art last semester about the design and building of the Vietnam Memorial in Washington DC. Some said it glorified the war, others thought it didn’t glorify it (or the soldiers’) enough. Both are somewhat valid – some works are designed to have a zillion different meanings. FWIW, I cried throughout the movie and if I went, I’d probably cry as well – I cried when I visited the Civil Rights Museum the second time (the first time, I was too busy playing teacher for my mom who didn’t know much about it) and will probably cry if I visit it again. As for words online and in real life, which is where this started, I think a lot of people don’t have empathy. You being offended over my use of a word may seem irrational or weird to me, but unless you’re lying/being a jerk, you really were hurt. I may not remove the word, but I will apologize before and after explaining my intent/meaning. And it is best to assume that you’re not just pulling my leg – what do I lose by apologizing? And like Snarky’s Machine, thinking of less offensive terms is fun! What do I mean when I want to throw out an *ist word? It reminds me of an assignment in 9th grade English where we were forbidden from losing get/got/gotten. And one more thing before I toddle off and waste more rainy Saturday time – there is a slight downside to being on pain medications, tori, though it isn’t outweighed by the huge downside of not being on them (pain so bad you can’t breathe or sleep or think). My sister has a “better” memory than me, or at least a different kind – she’s great with faces and names. So she’ll say, “look, there’s that guy, don’t you know him? what’s wrong with you? you ate lunch together once in sixth grade, he comes to my work all the time!” One time I got very mad and flustered, because I just don’t remember, and I worry about the effects of the various medications on my brain. But I’ve never been able to recall as well as she has, even before the pain started. It just feels magnified now. Good luck to you, and I hope a diagnosis means that you get some relief, chemically or otherwise. This week, classes started. One of my professors did an ‘ice breakers’ sort of thing, asked us all what we did outside of school, and I was thrilled to be able to say that outside of school I am an artist – and believe it. Selling a couple of paintings over the summer and having a shop carry some of my artwork definitely boosted my confidence, but this was the first time that I identified myself as an artist to someone else. Tori, do you think some of the difference in response you’re receiving to post-surgical pain and menstrual pain could be attributed to the fact that the pain is related to menstruation? It’s really staggering how powerful the taboo against menstruation – even *talking* about menstruation – can be. I’ve written a great deal about this – for example, see this post about how inadequate communication about details of menstrual symptoms makes diagnosis of adenomyosis difficult [http://menstruationresearch.org/2009/12/03/adenomyosis-under-diagnosed-cause-of-pelvic-pain/] and this one about how family, friends, and physicians minimize women’s menstrual pain and prevent timely diagnosis of endometriosis [http://menstruationresearch.org/2009/10/09/the-etiquette-of-menstrual-concealment-preserves-pain/]. The delay between onset of menstrual pain and diagnosis of endometriosis is an average of 8 YEARS in the UK and 11 YEARS in the US. Many people think menstruation is supposed to be painful, and if you complain, you’re just a crybaby. As for words online and in real life, which is where this started, I think a lot of people don’t have empathy. I’m really uncomfortable with putting it down to a lack of empathy, because I don’t think that’s always what’s going on. Apologies mean different things to different people. As an example, a lot of people take “I’m sorry that hurt you because that wasn’t my intention, but I don’t plan to change the behaviour and here’s why” as a non-apology, but just an “I’m sorry” when I don’t intend to modify my behaviour without at least noting that I don’t intend to change the circumstances that caused the discomfort/pain feels like I’m being patronising and dishonest, so if I know that the general attitude of the blog or person is that that’s a non-apology, and thus insulting, I probably wouldn’t apologise at all, not because I don’t think their pain is real, but because it would be dishonest to apologise when I know what they take that to mean is completely different to what I mean by it. Minna, maybe? It’s just that in my life, it’s been an issue of empathy. If the person using *ist words can’t think about the community they’re insulting, can they at least think about my feelings when I ask them not to say it? Not too many words get to me – most of the ones in AWP are ones I try not to use on and offline, but I’m not calling someone out for (most of) them because it’s about picking your battles (though I love discussing them with my mom when she’s in a tolerant/good mood!). And I’ve entered a weird place with the worst offender in my life – I ask her to stop, she doesn’t, but I don’t care except to worry about her life/future, not my feelings. When she used “retarded” so casually, I was more WTF than offended. I had the EXACT same experience with my surgery to remove endometriosis. I took hardly any pain pills, just a few over the counter drugs, after my surgery. The post surgery pain was just a minor soreness compared to the sharp, stabbing and burning that I was used to from endometriosis (pain all month long, worse during the 5-6 days of my period). It was such a relief to have that pain gone that the post surgical soreness was nothing. I had some of the same thoughts about people’s reaction to my pain from surgery vs. endometriosis pain. Back when my pain was invisible, and folks had only my word for it that I was hurting, I had a hard time getting doctors to understand how much it really hurt, let alone friends/family (my husband always believed me, though). Once the surgery provided a visible and socially accepted source for my pain then everyone believed me and wanted to help me. Wait a minute – where was all that help and empathy before the surgery when the pain was actually much worse for me?! Kali — wow, that’s wonderful! I got such a rush the first time I identified myself to someone as a writer and believed it (during NaNoWriMo 2009). I hope you continue to get sales and other wonderful things. About the language issue: I’m glad we’re talking about it. Thanks. I have a hard time verbalizing what I mean to say a lot, so having everyone weigh in is helpful. I’m also of the opinion that it doesn’t matter what your intent is — at least, in general conversation. In this case, I guess I’m more surprised that people still use words like “lame” and “retarded” when there ARE so many other better ones to mean what you say. Especially coming from a writer’s point of view. Words like that are crutches to me, and they have a tendency to hurt people. If that’s the case, why bother? .-= SavvyChristine´s last blog ..Simple Saturday: The Minute Waltz =-. Tori and ahimsa – ya’ll are luckier than me. But I’m still luckier. I want to scream at my doctor sometimes (and I have) because the pain makes me overthink. It goes haywire, I can’t see him for 5 days, why can’t he read my g-d mind?! Ami, I hear you. I remember taking incompletes in grad school because my depression got really bad. Not fun, but I was lucky enough to have some very understanding professors. I hope you manage to catch all the balls that you have in the air. And finally: Glee won a Golden Globe. The fans are going to be insufferably now, aren’t they? Bah. ahimsa, here’s hoping, though my surgery was only necessarily exploratory. Whether they’ve removed anything depends on what they found (or didn’t find) to remove, something I won’t know until the 25th. Elizabeth, I wouldn’t be at all surprised if the disparity was (at least partly) because the pain was related to menstruation. I’ve had multiple experiences with health care providers who’ve pretty much said (as in, this is a paraphrase, but not an exaggerated one), “Periods hurt. Your pain is normal.” I think there’s this supposition that menstrual pain is *supposed* to hurt and that people who menstruate are *supposed* to endure it. Which, really, if my cyclic pain matched my post-lap pain, I’d have no problem doing. I’ve had better luck getting doctors at least to take me seriously when I’ve given concrete examples of what the pain and bleeding keep me from doing — i.e., shaking and vomiting, blacking out while driving, etc. And my menstrual cup is the BEST THING EVAR in terms of measuring my flow — because instead of pads/tampons per hour, I can give a very objective measurment of milliliters per hour/per cycle, which is kind of awesome. It went undiagnosed for years longer because the first time I got up the courage — in the middle of a very, very severe case of anxiety that made it hard to leave the house at all — to talk to a doctor, I got a substitute doctor, a man in place of the woman gyne I usually had — who listened to my tale of extreme pain, being unable to sit up the first day (I could not get out of a reclining position at all, not from fatigue but from extreme pain) and unable to walk fully upright the rest of the week, the trips to the bathroom with the whole-body waves of pain where I would have killed myself if I could only move … the extreme sensitivity to cold, the headaches, the heavy clotted bleeding (I went to bed every night with a super-sized tampon, a blimp-sized overnight pad with wings as backup, and when I woke in the morning I had to be very very careful how I moved so as not to spill the puddle that had formed after the tampon and pad had been saturated)… and this doctor didn’t even look at me, and said “Sounds like PMDD, we’ll try another pill and if that doesn’t work we’ll try another one.” Which is very real for a lot of women — but it’s also mainly to do with mood. I listed 100% physical symptoms and he told me I was just a little irritable. amandaw, I’m finding the same thing WRT to treatment options. I’ve already done continuous oral contraceptives (which made it worse) and a hormonal IUD (fabulous for me when they last, but I’ve expelled 4 of them). I’ve had people advise me against this surgery because of the potential risks. At the same time, I’ve had to explain to other people (not here, where I know I haven’t shared all details — I mean like talking to my family in depth) that because of the nature of my various -osises, this surgery is *not* going to be able to remove all of my pain. If there were discrete endometriomas, yes, those may have been removed; if it was diffuse, not so much. But the doctor didn’t even try to do anything about the adenomyosis (’cause there’s really nothing he can do aside from removing the uterus). And even after having said that, I feel like I shouldn’t be complaining at all because, after 14 years of menstruating, I’ve finally found a doctor who takes me seriously and respects my input. Which is fantastic, but it’s also sad that such a thing has taken me so long… and not for lack of trying on my part. To Tori, amandaw, Kaitkyn, and any other endometriosis folks out there (may have missed some of the names in the comments) I hope my comment about my experience did not make it sound like I think that treatment for endometriosis is always a simple matter of surgery. I realize that there are so many different situations and that each patient has many different factors. It worked for me but I completely understand that it does not work for everyone. My larger point, probably badly worded, was about how pain or disability is seen when it is invisible (endometriosis pain) vs. when it is visible and socially accepted (post surgery pain). The way I was treated by most people, doctors included, regarding my endometriosis pain was completely different than the way I was treated regarding my surgery pain. This was true *even though* the surgical pain was not a problem for me while the endometriosis pain was disabling. I think the attitude of “if it’s invisible then maybe it’s not real” intersects with the sexist attitude of “if a woman has a symptom or complaint then it’s probably not serious” in the specific case of endometriosis as well as in many other disability issues that affect women. I hope that makes things more clear, but I’m not the most articulate person on the block. I’m sure someone else out there can do a better job of talking about these issues. Oh ahimsa hon! I was riffing, as usual. Just babbling about my experiences in response to other folks talking about theirs 🙂 No worries on my part. I think you made your point very well. Oh! No, Ahimsa. More power to you if surgery helps your pain. In blah news – I have had quite a depressing weekend. I started crying when I read the Haiti post here, and it only ramped up when I watched Taare Zameen Par (this kid with undiagnosed dyslexia is sent to a boarding school to a most heartwrenching song… brought back bad memories and made the dorm room feel so miserable). And now I hurt. After… doing nothing. But when I try to do something (like go buy my books) it hurts too. And classes hurt if I’m awake enough.